Grade I listed Victorian government office buildings. Route includes the magnificent and richly decorated Durbar Court, India Office Council Chamber, Locarno Suite and Foreign Office Grand Staircase. The Foreign Office has had many homes since the first Secretary of State for Foreign Affairs, Charles James Fox, was appointed in 1782. Initially based in Cleveland Row, it spent a brief period at the Cockpit in Whitehall, before being moved in 1793 to Downing Street opposite Nos.10 and 11. By the 1820s it had also spread into parallel Fludyer Street, which was built on the site of Axe Yard where Samuel Pepys began his famous diary. Although these houses had some large and handsome rooms, they were inadequate for a major department of state. There was no space to house the growing numbers of staff or state papers, and the buildings showed worrying signs of structural instability. The houses in Downing Street had been built over an old watercourse known as the Meresflete, and their foundations were giving way, leaving the Foreign Office buildings propped up by large wooden posts. Subsidence was worsened by the vibration from the printing presses in the attic, with regular complaints of gaping walls, bad smells and falling ceilings. Despite these difficulties, lack of money or public support at first prevented any major action. By the 1850s, however, the mistakes of the Crimean War encouraged demands for bureaucratic reform, and reinforced the view that government departments needed purpose-built buildings. In 1856, an international competition invited designs for a new Foreign Office, and – even though his design only came third in the competition – in 1858 George Gilbert Scott was appointed as the architect for the new Foreign Office, as well as the new Colonial and Home Office buildings, which sit on the right of the quadrangle. Scott’s buildings can be seen around the UK today, and include the Albert Memorial in Kensington and the restored Midland Grand Hotel at St Pancras. 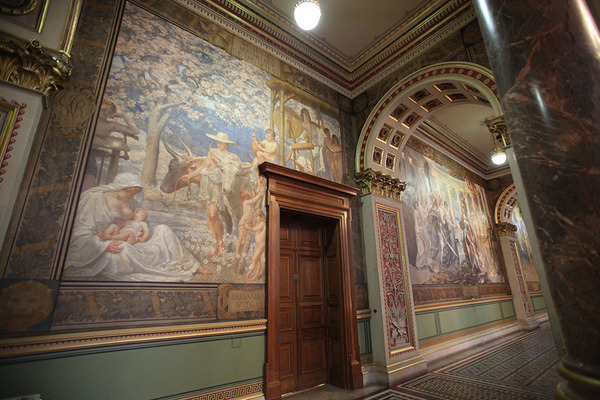 In addition to the work of Scott, the designs of a second architect can also be admired during a visit to the FCO. After the Indian Mutiny of 1857, the government of India passed from the East India Company to the newly formed India Office, which moved into a new home in the fourth quarter of the building, adjoining the Foreign Office. As Matthew Digby Wyatt was already employed as the India Office’s surveyor, the two architects reached a gentlemanly agreement that Scott would be responsible for the Foreign Office and exterior of the India Office, while Wyatt would remain sole responsibility for the India Office interior. The Foreign and India Office quarters of the building which you see today were started in 1861 and took 7 years to complete, opening in 1868. The Colonial and Home Office sections were then started and completed in 1875. By the end of World War One, the FCO had begun to suffer another desperate shortage of space. A new storey was built in 1925 and the grand rooms were partitioned into smaller offices, but by 1963 plans were announced to demolish it entirely. Fortunately, this never occurred: the classification of the site as a Grade 1 listed building and the demise of the Colonial Office delayed any final decision until the 1980s, when a programme of renovation was suggested instead. This was finally completed in 1997, returning the site to its former glory and creating 25 percent more usable accommodation. The route will take you through the former India Office before moving into the former Foreign Office. 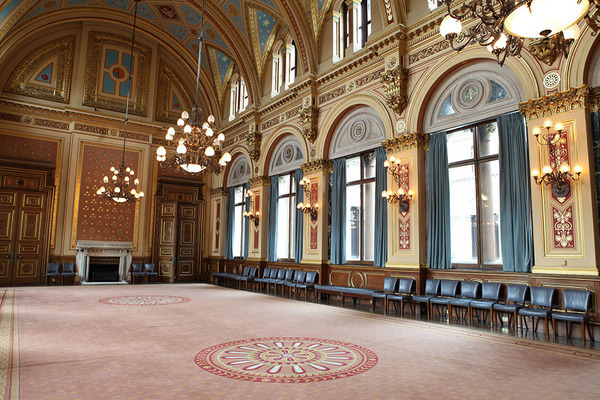 Today, all the buildings around the quadrangle house the Foreign and Commonwealth Office, and the rooms are all used on a daily basis by staff as well as hosting important ceremonial occasions. 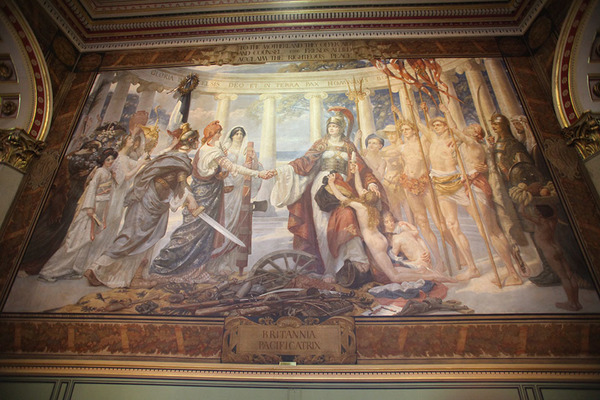 Although the building looks much as it did in the 1800s, today’s FCO is anything but old-fashioned. From sensor lights that only turn on when someone walks into the room, to “Hippo” bags that save 1 litre of water every time a toilet is flushed, the FCO is greener and has lower emissions than ever. The FCO also uses a wide range of technology: as well as its main website, the FCO is on Facebook, Twitter, Flickr and Youtube and uses blogs, video blogs and podcasts. If you have time, do explore the displays on our work, or talk to staff volunteers about life in the modern FCO.